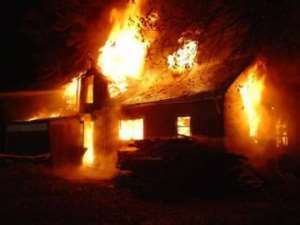 A fire outbreak on Friday afternoon has destroyed shops and other property along the commercial streets of the Bolgatanga Township in the Upper East Region. The fire which burnt down about five shops including; a mini-restaurant started around noon time and lasted close to one and half hours before it was brought under control. Though the Ghana National Fire Service (GNFS) responded swiftly to the urgent call and about four fire tenders were deployed to have the fire quenched, nothing was able to be saved as the fire burnt every to ashes leaving charred empty metal containers. According to Mr Douglas D Koyiri, the Assistant Chief Fire Officer of the Upper East Regional GNFS, said though the cause of the fire was not yet known, it would probably be the misappropriate use of fire around the shops and restaurant. He also indicated that unconfirmed reports available to the GNFS suggested that the fire was caused by a gas cylinder explosion in the mini restaurant. The Assistant Chief Fire Officer who is also the Upper East Regional Fire Commander stated that the cause of the fire was still under investigation and would be ascertained soon. He however, expressed sympathy for the loss of property and urged the public particularly, business persons to install fire protecting equipment to prevent huge damages in times of fire outbreak. Mr Koyiri advised the public to be disciplined in handling fire by avoiding the use of naked fires at markets as it could cause loss of property.